Oh so soft crafts, sheep-themed games, an early science activity that explores textures, and a new rhyme. We've herded sheep-filled activity sheets, decorations, word flashcards, and coloring pages in this theme! 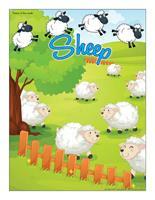 (Open thematic poster-Sheep) Print, laminate, and decorate the walls of your daycare with all kinds of posters. 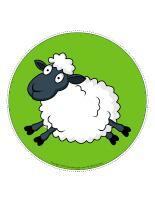 (Open educa-theme-Sheep) Print and laminate the document. The illustrations can be used to present the theme to children (and their parents) while decorating an area within your daycare. 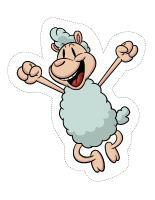 (Open educa-decorate-Sheep) Print, laminate, and cut out the various items. Use them to decorate your daycare and set the mood for the theme. (Open garland-Sheep) Print the illustrations. Let children decorate them. Cut them out and hang them within your daycare or near your daycare entrance to create a garland. This special tool was created in response to a special request received. (Open group identification-Sheep) Print. Use the content of this document to identify children's belongings or for various activities. Purchase several balls of yarn in different colors. Arrange them in a basket and set it on a table. Invite each child to choose a ball of yarn and have them tell you where they think the yarn came from. Discuss farm animals in general with your group. 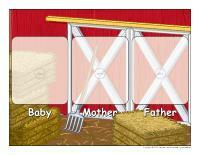 Identify different animal "homes" such as the stable, the henhouse, the barn, the pigpen, and the sheepfold. The pictures may be used as a memory game or to spark a conversation with your group. Use them to decorate the daycare or a specific thematic corner. 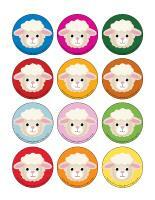 (Open picture game-Sheep) Print, laminate, and store in a Ziploc bag or in your thematic bins. 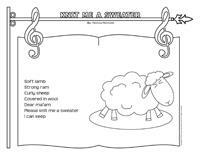 (Open activity sheets-Sheep) Print for each child and follow instructions. 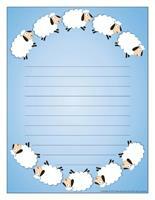 (Open writing activities-S like sheep) Print for each child or laminate for use with a dry-erase marker. (Open stationery-Sheep) Print. Use the stationery to communicate with parents, in your writing area, or even to identify your thematic bins. (Open educa-nuudles-Sheep) Print for each child. Have children color the sheet. Once they are done, they may use Magic Nuudles to turn the coloring pages into three dimensional works of art. Variation: If you do not have Magic Nuudles, ask children to fill the spaces designed for the Magic Nuudles with bingo markers or stickers. (Open scene-Sheepfold) Print, laminate, and cut out the items. Children can use them to create a variety of scenes. This theme is perfect for using the small farm we all have. If possible, add tractors, horses, and other farm animals. Use natural wooden blocks and any wood left over from recent renovations. Just sand the corners to soften them and avoid splinters. Use Easter straw to represent hay and let children build on it, use it to feed the animals, or as part of their constructions. Farm animal prints on cardboard that can be colored and cut out to create puppets. Provide recycled materials children can use to build a farm model. They may need your help to complete this project, but they will be very proud of the result. Plastic farm animals that can be pressed in paint and then on paper. Farm animal stamps and stamp pads or paint. A large piece of white paper (or a white bed sheet) for a creative project involving farm animals. A farmer's costume: straw hat, checkered shirt, and rubber boots. Decorate your role play area with pictures of farms and farm animals. Set up a puppet theatre and provide puppets that represent various farm animals. The stories children will invent will amaze you! Memory game involving pictures of farm animals. You may use a store-bought version or make your own using educatall picture games. Board games or lotto game involving farm animals. Black and white modeling dough to represent cows and white or brown modeling dough to create sheep. This may be a good time to make your own modeling dough and allow children to combine colors to create original farm animals. Provide cookie cutters that represent different farm animals. Association game involving farm animals and the sounds they make. Visit your local library; they may have one you can borrow. Association game involving animal families (example: horse, mare, and foal). If someone you know lives or works on a farm, ask them to show your group equipment such as saddles, a pitchfork, or part of a milking machine. Books about farm animals (visit your local library). Invite children to share their favorite books related to the theme with your group. Add stuffed animals that represent different farm animals to your reading area. Children will enjoy cuddling with them when they are looking at books. Song box filled with lyrics of songs related to farm animals. A story in which children are asked to act out the actions of different animals. 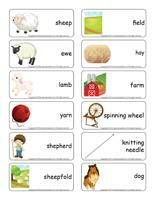 Show children a picture of a farm animal and encourage them to make the associated sound. Water table with farm animal figurines. Farm animals and a container filled with straw (real hay or Easter straw). A container filled with oats. After all, several farm animals eat them! (Open game-This is my spot-Sheep) Print two copies of each illustration. Use adhesive paper to stick one copy of each illustration on the table. Place the second copy in a bag. Children take turns picking an illustration to determine where they must sit at the table. You may also use the illustrations to determine children's naptime spots or their place in the task train. (Open my sheep path) Print, laminate, and secure the illustrations on the floor of your daycare to create a path leading to the areas frequently visited by children throughout the day. The path can lead to the bathroom, the cloakroom, etc. If you prefer, use the illustrations to delimit various areas. (Open lacing-Sheep) Print, laminate, and cut out the models. Punch holes around the contour of each model. Provide shoelaces or pieces of yarn children can thread through the holes. One child plays the role of the sheepdog while the other children pretend to be sheep. The sheepdog must catch the sheep (who must crawl on the floor). When the sheep lie on their backs, they are safe; the sheepdog can't catch them. If a sheep is caught while he/she is crawling, he/she becomes a sheepdog too and helps the other child catch the remaining sheep. 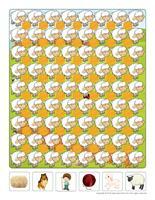 The game ends when there is only a single sheep left. Play leapfrog with your group. Have children stand single file and crouch down. The last child in line jumps over the other children, like a sheep. Keep going as long as children are having fun. You can make your way around the yard several times! (Open educ-association-Farm animal families) Print and laminate. Children must group the members of each family together (baby, mother, father). 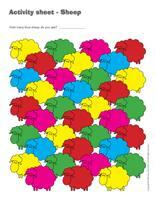 (Open educ-colors-Sheep) Print and laminate for durable, eco-friendly use. Of course, you may also print a copy for each child if you prefer. Children must associate each sheep to the correct color by drawing a line using a crayon of the corresponding color (or another crayon). (Open educ-intruder-Sheep) Print and laminate. Children must identify the six (6) intruders in the scene. Explore a variety of textures with your group. Collect different types of fabric, a piece of sandpaper, a piece of fake fur, a wool sock, etc. Help them notice which textures are rough and which ones are soft like a sheep. (Open educ-poster-Bananas) Print and laminate the posters and use them to present the food item to your group. The posters will make it possible for children to discover different forms of everyday food items. Display them near the table where children eat or in your kitchen area. (Open puppets-Sheep) Print the models on heavy cardboard. Have children cut them out and decorate them with a variety of materials. Glue a Popsicle stick behind each model to create puppets. 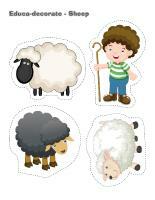 (Open models-Sheep) Print the models and use them for various crafts and activities throughout the theme. (Open models-Sheep) Print for each child. Encourage children to stick cotton balls all over a sheep model. Give each child a Styrofoam drinking glass. Have them set it upside down on a table and stick cotton balls all over it. Cut a circle out of white construction paper to represent a sheep's head. Glue it on the drinking glass and add cotton balls if desired. Complete the craft with wiggly eyes. 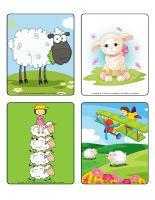 (Open shapes-Farm animals) Print a sheep for each child. Invite them to cover the entire shape with white glue and press oats or popcorn in the glue to add texture. (Open complete the drawing-Sheep) Print for each child. Have children complete the picture by drawing the missing elements. (Open I am learning to draw-A sheep) Print and laminate the model sheet. Encourage children to practice their drawing technique on the model sheet before trying to draw a sheep on their own. 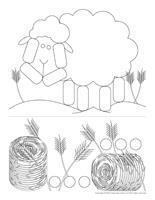 (Open coloring pages theme-Sheep) Print for each child.